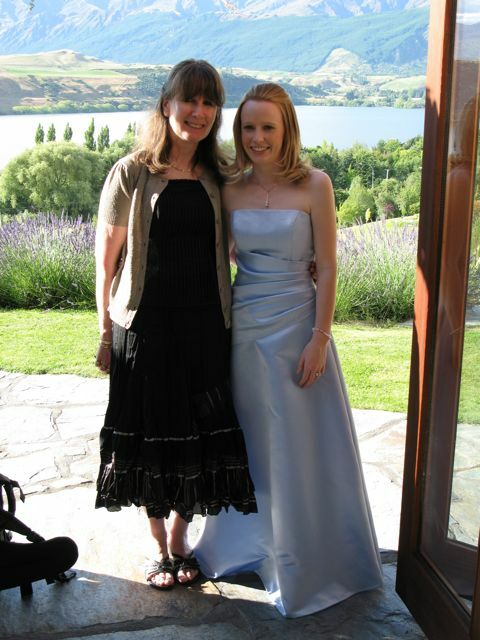 Here's my gorgeous daughter on her wedding day, in Queenstown, New Zealand. We all travelled over for the most wonderful family holiday. Now you can see the wedding dress I've been talking about. No, I didn't make this dress. 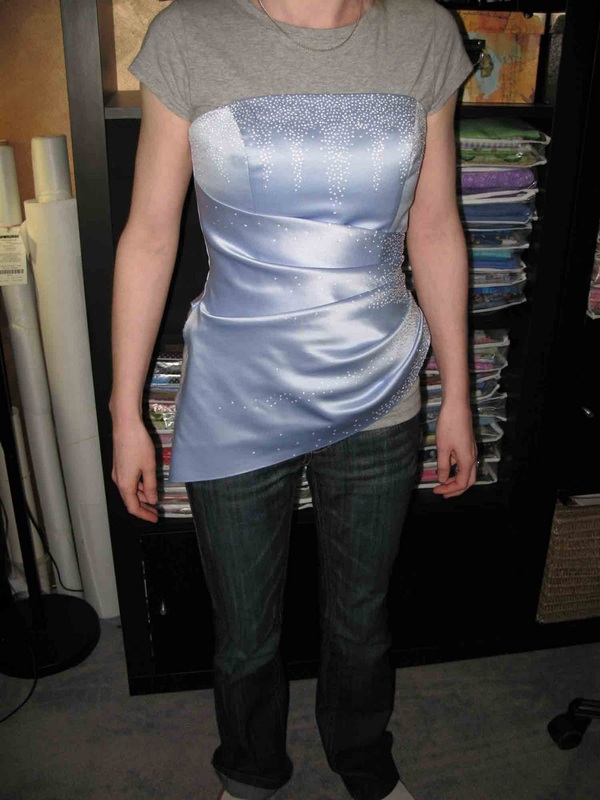 Tasha came up with the crazy idea that I could turn this dress into a formal day dress. Come on Mum, you can do it. You just have to cut it here, sew this here.... do this... and this..... as she held the dress and a piece of denim in front of the mirror. 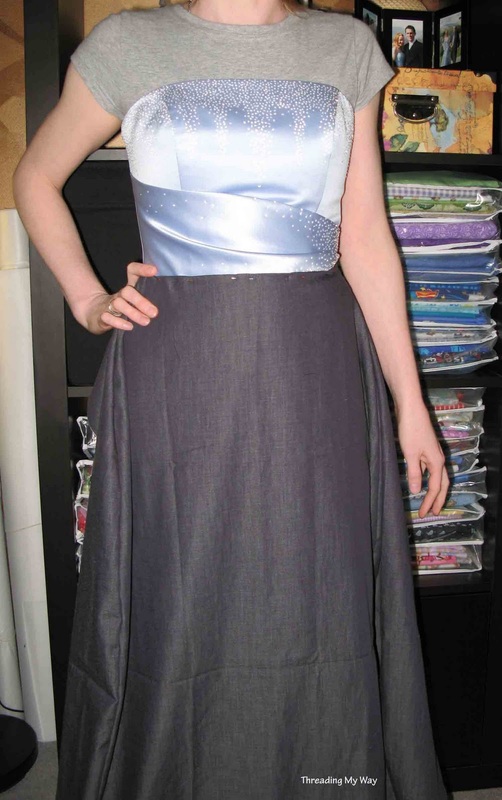 My non-sewing daughter convinced me that she wasn't going to wear it again and it would just sit unused in her wardrobe for the rest of its life. So, with a little trepidation, I cut the dress. Tasha had remembered that I had a piece of lightweight stretch denim in my stash and that's what we used for the bottom of the dress. So, I sewed this.... and this.... did this.... and this... until it started to take shape. Tasha designed and I sewed. Having a designer who doesn't sew, meant that the sequence of sewing, wasn't necessarily in a conventional order. Ideas changed and evolved. There was lots of unpicking. The process would have been a lot quicker, had I known how to draft a dress pattern. I'm perfectly happy making bags without a pattern. Draw a few sketches, do the Maths and it usually works out fine. 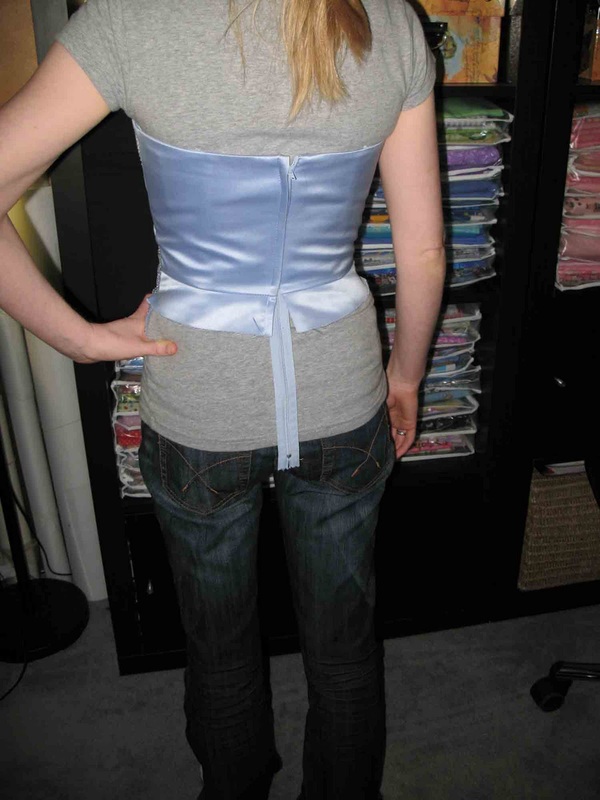 But when the sewing has to fit a person, that's another story. Especially when the design is close fitting. There's little room for error. I found that when I altered one thing, it affected the shape or fall of the fabric somewhere else. At one point, when the dress wasn't hanging properly, I found that the measurements from the zip to the side seams were not equal, by a substantial amount. Consequently, the seam allowance on one side is miniscule. In the end, it all worked out. It's definitely not perfect, but we are both very happy with the end result. We most definitely worked well as a team. Tasha is thrilled that she was able to wear her wedding dress, to the wedding of close friends. 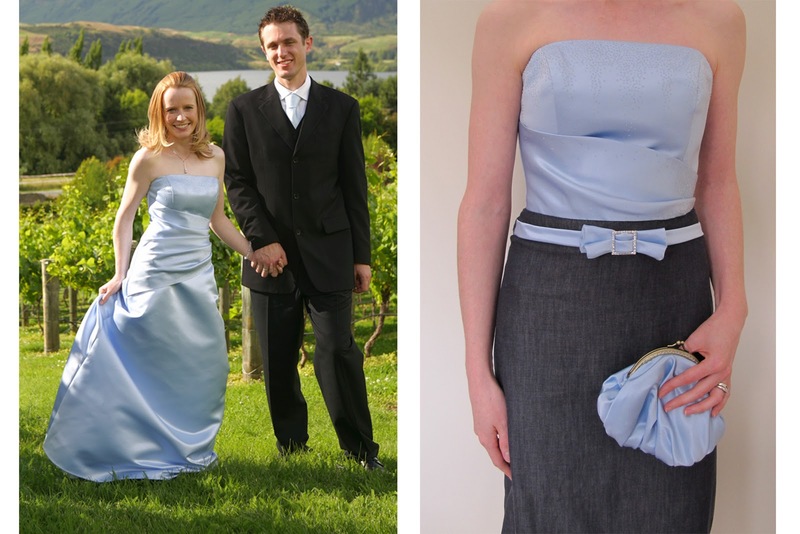 A new dress needs a matching purse, also made from the wedding dress. I'm sure you are wondering what's to become of the rest of the wedding dress. Hmmmm... We're thinking a tutu and perhaps a fairy dress some time in the future. No, not for Tasha and most definitely not for me. 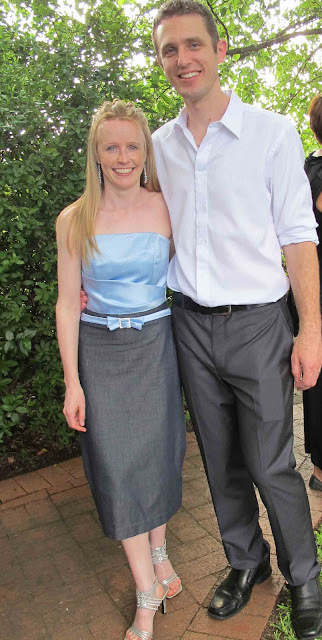 Read about our wedding dress transformation from Tash's perspective. Those big, blue eyes won out and the wedding dress was transformed yet again. Read about it here. Great job! I especially love the belt and bow. I would keep it as is myself, but I guess once you start transforming it doesn't stop. It looks fantastic and how amazing to be able to wear (part of) your wedding dress again.. I think the two of you were very brave to cut it up! Wow that is such a great transformation! I really love how it came out! The dress is very very pretty. You did an amazing job and the dress goes perfectly with the frame purse you made. Aren't you glad you have a daughter who has such great confidence in you? :) I giggled when I read that. But I think she is right. Oh, your daughter is beautiful! She looks so young and happy. The dress you made came out spectacular. I LOVE the way the denim part is a straight skirt, and the belt with the bow certainly make the dress. The fit looks perfect. I cannot believe she wants to transform it into a top! Aww! It's such a lovely usable dress! Maybe you can sew her a top from the left over wedding dress fabric..? Good for you for being so brave and cutting a wedding dress. You and your daughter did a great job. It's just beautiful, Pam, and Tash looks gorgeous in it. I'm with Karen D, wondering why not leave this dress as is and use another part of the wedding dress to make the next top, especially as Tash wants a more casual top. This one is very elegant with its bodice feature, and it seems such a waste to undo all your hard work and kill off the dress.Why not end up with two new outfits? In fact, why not see how many outfits you can make out of the dress? GREAT transformation. Totally 2 ways of dressing. The purse goes so well with it. A lovely transformation, Pam! Your daughter would look gorgeous in a paper sack, but she is very pretty in both versions of the dress as well. The purse is a great finishing touch. Bravo! You did a fantastic job! It looks amazing. Pam, you are amazingly brave and you did great! But I am totally with Keren, I can't believe your daughter has asked you to take it apart again. This dress is so beautiful as it is. That looks fab!!! I'm super amazed you didn't use a pattern. Your daughter looks stunning! AGH!!!! Pam I wish you could hear me screaming from here! The dress is GORGEOUS!!! Way to go!!! So beautiful. 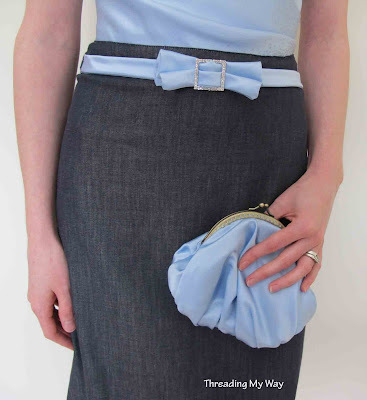 And the pouch, well, obviously that is stunning too!!! Love love love! We should all make matching purses and outfits. Hahahahahaa...next year??? Wow - you are very brave and very talented! wow, that looks great with that charcoal skirt, especially next to her similarly dressed hubby. well done! what a great job! You are so awesome! I love the converted dress. Just enough sparkle on top to be fun and a great contrast with the dressy stretch denim. Superb! What a wonderful idea! You made a gorgeous dress from that dress. I love that they got married in Queenstown. I love it there. How fabulous! So nice that you could alter her wedding dress so it can be used again! Nice to know your daughter has that faith in you as her mum that you can do anything! and so you can! Great work on the dress - and I'm looking forward to seeing the next transformation too! What a great dress! I recently started chopping into the bridesmaids dresses hanging in my closet since they haven't been worn in years. Well done Pam that looks stunning! That is really cute. 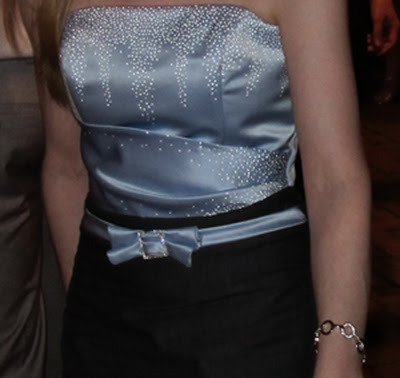 When I had my wedding dress made (that I designed) I had it made in two pieces so I could wear the top out with another skirt. In the end I sealed it up and hope to save it for my daughter some day. You've done a fantastic job! I admire your bravery. You're daughter's right too - 9 1/2 years down the track my dress is still sitting in its box at the top of the wardrobe waiting for I'm not sure what! Wow, I'm so impressed! I can only imagine the cringing as you make that first cut through her wedding dress! You could make some great pillows out of the rest of her dress, too, or a sweet baby blanket for some time in the future. That fabric is beautiful! Wow! Way to think outside of the box! Oh my goodness...this is fabulous!! Great job! I think it's wonderful that it's not tucked in a closet somewhere, collecting dust. Gorgeous. This came out beautifully! Now, I really think she is pushing it with the whole top thing. Hee hee ;) Found you at Weekend Wander. Looks awesome! You are very brave! Thanks so much for linking up to Things I’ve Done Thursday!! I love this! I don't think I would have been so brave. It turned out great! Thanks for sharing with Blog Stalking Thursday! This is spectacular! I love it, and very impressed and inspired to do something with my dress! Really good job! I like the end result. Lovely, I love the way it turned out! So amazing! I love how you just went for it with your scissors! What a wonderful feeling to design something with your daughter. I'd love if you would check out our Sew Crafty Christmas event and Giveaways! Happy Sewing! Keep it up! This transformation is awesome and was featured on this weeks Thingamajig Thursday party. Thank you so much for sharing last week and hope to see you again! Beautiful! Just the perfect way to upcycle something we would never get rid of, and now she'll be able to use again. Great work! What a great idea! So clever! Thank you for sharing at my party! Amazing transformation! I'm your newest follower-stop by for a visit!! Hi Pam! Your project was one of the top voted links at my "Best of 2011" link party. Make sure to drop by my site tomorrow to see it featured. Congrats!! That is so clever!! I mean... most of us keep their wedding dress, but seriously... when do we ever look at it again? This is SUCH a good idea! Wow. I'd be terrified of cutting up my wedding dress but this turned out beautiful! Thanks for linking up! It is incredible! And I adored your comments with the photos! Amazing transformation! Ohh so cute! Wish my mom could sew like this. I love the transformation. I have thought many times about doing something with my wedding dress but have been to too scared. In a couple of months time we celebrate our 25th wedding anniversary and I'd really love to turn all that Chantilly lace into a new dress and I think you have given me the inspiration to just do it. It's true, when a daughter looks at you, you can't simply say no! It's really nice how denim matches with the blue-sky shining top... and, mum, you can do it!!! PS: I love your new G+ comments!!! Thanks to share this information i really like this post. as she held the dress and a piece of denim in front of the mirror.